We invite you to step inside our inn and visit one of the premier B&B's in the area, the Key West Harbor Inn. We offer luxury bed and breakfast lodging and accommodations at our Key West inn- perfect for a relaxing vacation or a romantic getaway. Imagine the magnificent Key West sunsets and tall ships sailing towards the horizon. Snorkeling around the famed Dry Tortugas, fishing some of the best waters in Florida, or just relaxing by our tropical pool- these are a few of the many activities that await you only steps away from your own piece of paradise, The Key West Harbor Inn. Once you walk into our beautiful gardens across from the Boardwalk, you may never want to leave. Isn't it time to discover why? 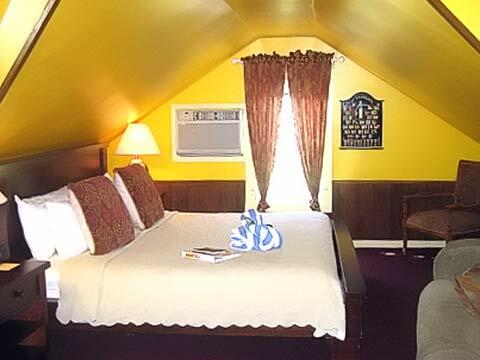 Key West Guesthouses dream of offering Key West Accommodations in a locale such as ours. The Key West Harbor Inn is an elegant yet comfortable three story mansion on a street of ornate Victorians in Old Town Key West. Located at the very end of Elizabeth Street, it is just steps away from the boardwalk of the Historic Key West Seaport and two blocks a way from the fervor of Duval Street. The house was built in 1850 by a local physician named Dr. Plummer and was located on Simonton Street near the intersection of Southard. It stood there for nearly 100 years until it was bought by two sisters by the name of Dewey who decided to have it moved. The home was moved all the way to it's present location and purposely placed with it's side facing Elizabeth Street so that the front of the home would face the harbor and those beautiful Key West sunsets. Today the home along with the Pool house and Carriage house which makes up the Key West Harbor Inn are completely surrounded by an enclosed tropical garden. Our guests refer to the Inn as "an island within an island". It is feeling you get when you are in your own private piece of Paradise. So whether you're lounging around the sun-drenched heated pool, or relaxing in the shade of our huge poinciana trees, this is the place where your dreams will begin. Where else to stay than right next to it all! People come to Key West to enjoy what we down here do best, and that is...water sports of all kinds. Are you into snorkeling? Then, come and snorkel in North America's only living reef. Who knows what you'll find down there, maybe even treasure. Mel Fisher found hundreds of millions and they say that they might be close to finding another Spanish Galleon down there. Then there are the deep sea fishing expeditions that go for trophy Black Marlins like "Papa", Ernest Hemingway, was so fond of doing. Sea Kayaks, jet skis, Dolphin watching eco-tours all depart right next to the Inn. No need to drive and find parking, just walk across Lazy Way and there you are. Everything you could possibly imagine from truly romantic sunset cruises to adventurous fishing expeditions to the Marquesas or sight seeing to Fort Jefferson, all right next to your private piece of paradise, the Key West Harbor Inn. Remember all the activities at sunset in Mallory Square are just 3 blocks away! At the Key West Harbor Inn, we are here to serve you. Our friendly and thoughtful staff stands ready to arrange for fishing, diving or sailing activities, make a reservation or a recommendation, solve a problem or just to share a moment with you during the best vacation of your life!